A microgrid is a localized group of electricity sources and loads that normally operates connected to and synchronous with the traditional wide area synchronous grid (macrogrid), but can also disconnect to "island mode" — and function autonomously as physical or economic conditions dictate. In this way, a microgrid can effectively integrate various sources of distributed generation (DG), especially Renewable Energy Sources (RES) - renewable electricity, and can supply emergency power, changing between island and connected modes. Control and protection are challenges to microgrids. A very important feature is also to provide multiple end-use needs as heating, cooling, and electricity at the same time since this allows energy carrier substitution and increased energy efficiency due to waste heat utilization for heating, domestic hot water, and cooling purposes (cross sectoral energy usage). The United States Department of Energy Microgrid Exchange Group defines a microgrid as a group of interconnected loads and distributed energy resources (DERs) within clearly defined electrical boundaries that acts as a single controllable entity with respect to the grid. A microgrid can connect and disconnect from the grid to enable it to operate in both connected or island-mode. The EU research project describes a microgrid as comprising Low-Voltage (LV) distribution systems with distributed energy resources (DERs) (microturbines, fuel cells, photovoltaics (PV), etc. ), storage devices (batteries, flywheels) energy storage system and flexible loads. Such systems can operate either connected or disconnected from the main grid. The operation of microsources in the network can provide benefits to the overall system performance, if managed and coordinated efficiently. The focus of campus microgrids is aggregating existing on-site generation with multiple loads located in tight geography in which owner easily manage them. 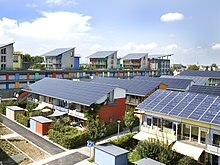 Community Microgrids can serve a few up to thousands of customers and support the penetration of local energy (electricity, heating, and cooling). In a community microgrid, some houses may have some renewable sources that can supply their demand as well as that of their neighbors within the same community. The community microgrid may also have a centralized or several distributed energy storages. Such microgrids can be in the form of an ac and dc microgrid coupled together through a bi-directional power electronic converter. These microgrids never connect to the Macrogrid and instead operate in an island mode at all times because of economic issues or geographical position. Typically, an "off-grid" microgrid is built in areas that are far distant from any transmission and distribution infrastructure and, therefore, have no connection to the utility grid. Studies have demonstrated that operating a remote area or islands' off-grid microgrids, that are dominated by renewable sources, will reduce the levelized cost of electricity production over the life of such microgrid projects. Large remote areas may be supplied by several independent microgrids, each with a different owner (operator). Although such microgrids are traditionally designed to be energy self-sufficient, intermittent renewable sources and their unexpected and sharp variations can cause unexpected power shortfall or excessive generation in those microgrids. This will immediately cause unacceptable voltage or frequency deviation in the microgrids. To remedy such situations, it is possible to interconnect such microgrids provisionally to a suitable neighboring microgrid to exchange power and improve the voltage and frequency deviations. This can be achieved through a power electronics-based switch after a proper synchronization or a back to back connection of two power electronic converters and after confirming the stability of the new system. The determination of a need to interconnect neighboring microgrids and finding the suitable microgrid to couple with can be achieved through optimization or decision making approaches. These microgrids are being actively deployed with focus on both physical and cyber security for military facilities in order to assure reliable power without relying on the Macrogrid. These types of microgrids are maturing quickly in North America and Asia Pacific; however, the lack of well –known standards for these types of microgrids limits them globally. Main reasons for the installation of an industrial microgrid are power supply security and its reliability. There are many manufacturing processes in which an interruption of the power supply may cause high revenue losses and long start-up time. Industrial microgrids can be designed to supply circular-economy (near-)zero-emission industrial processes, and can integrate combined heat and power (CHP) generation, being fed by both renewable sources and waste processing; energy storage can be additionally used to optimize the operations of these sub-systems. A microgrid presents various types of generation sources that feed electricity, heating, and cooling to user. These sources are divided into two major groups – thermal energy sources (e.g,. natural gas or biogas generators or micro combined heat and power) and renewable generation sources (e.g. wind turbines, solar). In a microgrid, consumption simply refers to elements that consume electricity, heat, and cooling which range from single devices to lighting, heating system of buildings, commercial centers, etc. In the case of controllable loads, the electricity consumption can be modified in demand of the network. In microgrid, energy storage is able to perform multiple functions, such as ensuring power quality, including frequency and voltage regulation, smoothing the output of renewable energy sources, providing backup power for the system and playing crucial role in cost optimization. It includes all of electrical, pressure, gravitational, flywheel, and heat storage technologies. When multiple energy storages with various capacities are available in a microgrid, it is preferred to coordinate their charging and discharging such that a smaller energy storage does not discharge faster than those with larger capacities. Likewise, it is preferred a smaller one does not get fully charged before those with larger capacities. This can be achieved under a coordinated control of energy storages based on their state of charge. If multiple energy storage systems (possibly working on different technologies) are used and they are controlled by a unique supervising unit (an Energy Management System - EMS), a hierarchical control based on a master/slaves architecture can ensure best operations, particularly in the islanded mode. It is the point in the electric circuit where a microgrid is connected to a main grid. Microgrids that do not have a PCC are called isolated microgrids which are usually presented in the case of remote sites (e.g., remote communities or remote industrial sites) where an interconnection with the main grid is not feasible due to either technical or economic constraints. A microgrid is capable of operating in grid-connected and stand-alone modes and of handling the transition between the two. In the grid-connected mode, ancillary services can be provided by trading activity between the microgrid and the main grid. Other possible revenue streams exist. In the islanded mode, the real and reactive power generated within the microgrid, including that provided by the energy storage system, should be in balance with the demand of local loads. Microgrids offer an option to balancing the need to reduce carbon emissions while continuing to provide reliable electric energy in periods of time that renewable sources of power are not available. Microgrids also offer the security of being hardened from severe weather and natural disasters by not having large assets and miles of above-ground wires and other electric infrastructure that needs to be maintained or repaired following these events. A microgrid may transition between these two modes because of scheduled maintenance, degraded power quality or a shortage in the host grid, faults in the local grid, or for economical reasons. By means of modifying energy flow through microgrid components, microgrids facilitate the integration of renewable energy generation such as photovoltaic, wind and fuel cell generations without requiring re-design of the national distribution system. Modern optimization methods can also be incorporated into the microgrid energy management system to improve efficiency, economics, and resiliency. Bidirectional power flows: The presence of distributed generation (DG) units in the network at low voltage levels can cause reverse power flows that may lead to complications in protection coordination, undesirable power flow patterns, fault current distribution, and voltage control. Stability issues: Interaction of control system of DG units may create local oscillations, requiring a thorough small-disturbance stability analysis. Moreover, transition activities between the grid-connected and islanding (stand-alone) modes of operation in a microgrid can create transient stability. Recent studies have shown that direct-current (DC) microgrid interface can result in significantly simpler control structure, more energy efficient distribution and higher current carrying capacity for the same line ratings. Modeling: Many characteristic in traditional scheme such as prevalence of three-phase balanced conditions, primarily inductive transmission lines, and constant-power loads are not necessarily hold valid for microgrids, and consequently models need to be revised. Low inertia: The microgrid shows low-inertia characteristic that are different to bulk power systems where high number of synchronous generators ensures a relatively large inertia. Especially if there is a significant share of power electronic-interfaced DG units, this phenomenon is more clear. The low inertia in the system can lead to severe frequency deviations in stand-alone operation if a proper control mechanism is not implemented. Synchronous generators run at the same frequency as the grid, thus providing a natural damping effect to sudden frequency variations. Synchronverters are inverters which mimic the synchronous generator to provide frequency control. Other options are for example to control a battery energy storage or a flywheel to balance the frequency. Uncertainty: The operation of microgrids contain very much uncertainty in which the economical and reliable operation of microgrids rely on. Load profile and weather forecast are two of them that make this coordination becomes more challenging in isolated microgrids, where the critical demand-supply balance and typically higher component failure rates require solving a strongly coupled problem over an extended horizon. This uncertainty is higher than those in bulk power systems, due to the reduced number of loads and highly correlated variations of available energy resources (limited averaging effect). To plan and install Microgrids correctly, engineering modelling is needed. Multiple simulation tools and optimization tools exist to model the economic and electric effects of Microgrids. A widely used economic optimization tool is the Distributed Energy Resources Customer Adoption Model (DER-CAM) from Lawrence Berkeley National Laboratory. Another frequently used commercial economic modelling tool is Homer Energy, originally designed by the National Renewable Energy Laboratory. There are also some power flow and electrical design tools guiding the Microgrid developers. The Pacific Northwest National Laboratory designed the public available GridLAB-D tool and the Electric Power Research Institute (EPRI) designed OpenDSS to simulate the distribution system (for Microgrids). A professional integrated DER-CAM and OpenDSS version is available via BankableEnergy. A European tool that can be used for electrical, cooling, heating, and process heat demand simulation is EnergyPLAN from the Aalborg University in Denmark. In regards to the architecture of microgrid control, or any control problem, there are two different approaches that can be identified: centralized and decentralized. A fully centralized control relies on a large amount of information transmittence between involving units and then the decision is made at a single point. Hence, it will present a big problem in implementation since interconnected power systems usually cover extended geographic locations and involves an enormous number of units. On the other hand, in a fully decentralized control, each unit is controlled by its local controller without knowing the situation of others. A compromise between those two extreme control schemes can be achieved by means of a hierarchical control scheme consisting of three control levels: primary, secondary, and tertiary. The primary control provides the setpoints for a lower controller which are the voltage and current control loops of DERs. These inner control loops are commonly referred to as zero-level control. Secondary control has typically seconds to minutes sampling time (i.e. slower than the previous one) which justifies the decoupled dynamics of the primary and the secondary control loops and facilitates their individual designs. Setpoint of primary control is given by secondary control in which as a centralized controller, it restores the microgrid voltage and frequency and compensates for the deviations caused by variations of loads or renewable sources. The secondary control can also be designed to satisfy the power quality requirements, e.g., voltage balancing at critical buses. Tertiary control is the last (and the slowest) control level which consider economical concerns in the optimal operation of the microgrid (sampling time is from minutes to hours), and manages the power flow between microgrid and main grid. This level often involves the prediction of weather, grid tariff, and loads in the next hours or day to design a generator dispatch plan that achieves economic savings. In case of emergency like blackouts, Tertiary control could be utilized to manage a group of interconnected microgrids to form what is called "microgrid clustering" that could act as a virtual power plant and keep supplying at least the critical loads. During this situation the central controller should select one of the microgrid to be the slack (i.e. master) and the rest as PV and load buses according to a predefined algorithm and the existing conditions of the system (i.e. Demand and generation), in this case, the control should be real time or at least high sampling rate. A less utility influenced controller framework has been designed in the latest Microgrid controller standard from the Institute of Electrical and Electronics Engineers, the IEEE 2030.7. That concept relies on 4 blocks: a) Device Level control (e.g. Voltage and Frequency Control), b) Local Area Control (e.g. data communication), c) Supervisory (software) controller (e.g. forward looking dispatch optimization of generation and load resources), and d) Grid Layer (e.g. communication with utility). A wide variety of complex control algorithms exist, making it difficult for small Microgrids and residential Distributed Energy Resource (DER) users to implement energy management and control systems. Especially, communication upgrades and data information systems can make it expensive. Thus, some projects try to simplify the control via off-the shelf products and make it usable for the mainstream (e.g. using a Raspberry Pi). A wirelessly managed microgrid is deployed in rural Les Anglais, Haiti. The system consists of a three-tiered architecture with a cloud-based monitoring and control service, a local embedded gateway infrastructure and a mesh network of wireless smart meters deployed at 52 buildings. Non-Technical Loss (NTL) represents a major challenge when providing reliable electrical service in developing countries, where it often accounts for 11-15% of total generation capacity. An extensive data-driven simulation on 72 days of wireless meter data from a 430-home microgrid deployed in Les Anglais, Haiti has been conducted to investigate how to distinguish NTL from the total power losses which helps energy theft detection. A community-based diesel-powered micro-grid system was set up in rural Kenya near Mpeketoni called the Mpeketoni Electricity Project. Due to the installment of these microgrids Mpeketoni has seen a large growth in its infrastructure. Such growth includes increased productivity per worker with an increase of 100% to 200% and an income levels increase of 20–70% depending on the product. A micro-turbine, fuel-cell, multiple batteries, hydrogen electrolyzer, and PV enabled Winery in Sonoma, California. ^ "Features and Benefits - Microgrids". www.districtenergy.org. Retrieved 2018-06-28. ^ "DOE Microgrid Workshop Report" (PDF). ^ Hatziargyriou, Nikos (2014). Microgrids Architectures and Control. John Wiley and Sons Ltd. p. 4. ISBN 978-1-118-72068-4. ^ a b c d Ernie Hayden. "Introduction to Microgrids" (PDF). Retrieved 20 June 2016. ^ Saleh, M.; Esa, Y.; Mhandi, Y.; Brandauer, W.; Mohamed, A. (October 2016). "Design and implementation of CCNY DC microgrid testbed". 2016 IEEE Industry Applications Society Annual Meeting: 1–7. doi:10.1109/IAS.2016.7731870. ISBN 978-1-4799-8397-1. ^ Thomson, Greg (2018). "The Sonoma Community Microgrid Initiative" (PDF). Clean Coalition. ^ Chandrasena, Ruwan P.S. ; Shahnia, Farhad; Ghosh, Arindam; Rajakaruna, Sumedha (2015-08-06). "Dynamic operation and control of a hybrid nanogrid system for future community houses". IET Generation, Transmission & Distribution. 9 (11): 1168–1178. doi:10.1049/iet-gtd.2014.0462. ISSN 1751-8687. ^ a b "Design and Analyze Micro-Grids". ^ Ali, Liaqat; Shahnia, Farhad (June 2017). "Determination of an economically-suitable and sustainable standalone power system for an off-grid town in Western Australia". Renewable Energy. 106: 243–254. doi:10.1016/j.renene.2016.12.088. ISSN 0960-1481. ^ Shahnia, Farhad; Moghbel, Moayed; Arefi, Ali; Shafiullah, G M; Anda, Martin; Vahidnia, Arash (November 2017). "Levelized cost of energy and cash flow for a hybrid solar-wind-diesel microgrid on Rottnest island". 2017 Australasian Universities Power Engineering Conference (AUPEC): 1–6. doi:10.1109/aupec.2017.8282413. ISBN 9781538626474. ^ Pashajavid, Ehsan; Shahnia, Farhad; Ghosh, Arindam (2015). "Development of a Self-Healing Strategy to Enhance the Overloading Resilience of Islanded Microgrids". IEEE Transactions on Smart Grid: 1. doi:10.1109/tsg.2015.2477601. ISSN 1949-3053. ^ Pashajavid, Ehsan; Shahnia, Farhad; Ghosh, Arindam (2017-01-05). "Provisional internal and external power exchange to support remote sustainable microgrids in the course of power deficiency". IET Generation, Transmission & Distribution. 11 (1): 246–260. doi:10.1049/iet-gtd.2016.0897. ISSN 1751-8687. ^ Pashajavid, Ehsan; Shahnia, Farhad; Ghosh, Arindam (June 2015). "Overload management of autonomous microgrids". 2015 IEEE 11th International Conference on Power Electronics and Drive Systems: 73–78. doi:10.1109/peds.2015.7203515. ISBN 9781479944026. ^ Pashajavid, Ehsan; Shahnia, Farhad; Ghosh, Arindam (September 2015). "Overloading conditions management in remote networks by coupling neighboring microgrids". 2015 50th International Universities Power Engineering Conference (UPEC): 1–6. doi:10.1109/upec.2015.7339874. ISBN 9781467396820. ^ Shahnia, Farhad; Bourbour, Soheil (September 2017). "A practical and intelligent technique for coupling multiple neighboring microgrids at the synchronization stage". Sustainable Energy, Grids and Networks. 11: 13–25. doi:10.1016/j.segan.2017.06.002. ISSN 2352-4677. ^ Susanto, Julius; Shahnia, Farhad; Ghosh, Arindam; Rajakaruna, Sumehda (September 2014). "Interconnected microgrids via back-to-back converters for dynamic frequency support". 2014 Australasian Universities Power Engineering Conference (AUPEC): 1–6. doi:10.1109/aupec.2014.6966616. ISBN 9780646923758. ^ Arefi, Ali; Shahnia, Farhad (2017). "Tertiary Controller-based Optimal Voltage and Frequency Management Technique for Multi-Microgrid Systems of Large Remote Towns". IEEE Transactions on Smart Grid. 9 (6): 5962–5974. doi:10.1109/tsg.2017.2700054. ISSN 1949-3053. ^ Shahnia, Farhad; Bourbour, Soheil; Ghosh, Arindam (2015). "Coupling Neighboring Microgrids for Overload Management Based on Dynamic Multicriteria Decision-Making". IEEE Transactions on Smart Grid: 1. doi:10.1109/tsg.2015.2477845. ISSN 1949-3053. ^ a b Guarnieri, M.; Bovo, A.; Giovannelli, A.; Mattavelli, P. (2018). "The VERITAS multi-technology microgrid experiment: a design review". IEEE Industrial Electronics Magazine. 12 (3): 19–31. doi:10.1109/MIE.2018.2855735. ^ Hosseinimehr, Tahoura; Ghosh, Arindam; Shahnia, Farhad (May 2017). "Cooperative control of battery energy storage systems in microgrids". International Journal of Electrical Power & Energy Systems. 87: 109–120. doi:10.1016/j.ijepes.2016.12.003. ISSN 0142-0615. ^ Alexis Kwasinki. "Grid-Microgrids Interconnection". Retrieved 20 June 2016. ^ Stadler, Michael; Cardoso, Gonçalo; Mashayekh, Salman; Forget, Thibault; DeForest, Nicholas; Agarwal, Ankit; Schönbein, Anna (2016). "Value streams in microgrids: A literature review". Applied Energy. 162: 980–989. doi:10.1016/j.apenergy.2015.10.081. ISSN 0306-2619. ^ a b c d "Communication Based Control for DC Microgrids - IEEE Journals & Magazine". ieeexplore.ieee.org. Retrieved 2018-05-05. ^ a b c d e f g h i A. Cañizares, Claudio (2014). "Trends in Microgrid Control". IEEE Transactions on Smart Grid. 5 (4): 1905–1919. doi:10.1109/TSG.2013.2295514. ^ a b A. A. Salam, A. Mohamed and M. A. Hannan (2008). "Technical challenges on Microgrids". ARPN Journal of Engineering and Applied Sciences. 3: 64. ^ F.D Kanellos; A.I. Tsouchnikas; N.D. Hatziargyriou. (June 2005). "Microgrid Simulation during Grid Connected and Islanded Modes of Operation". Proc. Of the Canada International Conference on Power System Transient (IPTS'05). 113: 19–23. ^ a b c Jin, Ming; Feng, Wei; Liu, Ping; Marnay, Chris; Spanos, Costas (2017-02-01). "MOD-DR: Microgrid optimal dispatch with demand response". Applied Energy. 187: 758–776. doi:10.1016/j.apenergy.2016.11.093. ^ Tenti, P.; Caldognetto, T. (2017). "On Microgrid Evolution to Local Area Energy Network (E-LAN)". IEEE Transactions on Smart Grid: 1. doi:10.1109/TSG.2017.2772327. ^ Mashayekh, Salman; Stadler, Michael; Cardoso, Gonçalo; Heleno, Miguel (2017). "A mixed integer linear programming approach for optimal DER portfolio, sizing, and placement in multi-energy microgrids". Applied Energy. 187: 154–168. doi:10.1016/j.apenergy.2016.11.020. ISSN 0306-2619. ^ a b Saleh, M. S.; Althaibani, A.; Esa, Y.; Mhandi, Y.; Mohamed, A. A. (October 2015). "Impact of clustering microgrids on their stability and resilience during blackouts". 2015 International Conference on Smart Grid and Clean Energy Technologies (ICSGCE): 195–200. doi:10.1109/ICSGCE.2015.7454295. ISBN 978-1-4673-8732-3. ^ Dragičević, T.; Lu, X.; Vasquez, J. C.; Guerrero, J. M. (2016-07-01). "DC Microgrids #x2014;Part I: A Review of Control Strategies and Stabilization Techniques". IEEE Transactions on Power Electronics. 31 (7): 4876–4891. doi:10.1109/TPEL.2015.2478859. ISSN 0885-8993. ^ Dragičević, T.; Lu, X.; Vasquez, J. C.; Guerrero, J. M. (2016-05-01). "DC Microgrids #x2014;Part II: A Review of Power Architectures, Applications, and Standardization Issues". IEEE Transactions on Power Electronics. 31 (5): 3528–3549. Bibcode:2016ITPE...31.3528D. doi:10.1109/TPEL.2015.2464277. ISSN 0885-8993. ^ Kim, Yun-Su; Kim, Eung-Sang; Moon, Seung-Il (January 2016). "Frequency and Voltage Control Strategy of Standalone Microgrids With High Penetration of Intermittent Renewable Generation Systems". IEEE Transactions on Power Systems. 31 (1): 718–728. doi:10.1109/TPWRS.2015.2407392. ISSN 0885-8950. ^ "Hardware based testing of communication based control for DC microgrid - IEEE Conference Publication". ieeexplore.ieee.org. Retrieved 2018-05-05. ^ Pashajavid, Ehsan; Shahnia, Farhad; Ghosh, Arindam (September 2015). "A decentralized strategy to remedy the power deficiency in remote area microgrids". 2015 50th International Universities Power Engineering Conference (UPEC): 1–6. doi:10.1109/upec.2015.7339865. ISBN 9781467396820. ^ M. D. Ilić; S. X. Liu (1996). Hierarchical Power Systems Control: Its Value in a Changing Industry (Advances in Industrial Control). London: Springer. ^ Shahnia, Farhad; Ghosh, Arindam; Rajakaruna, Sumedha; Chandrasena, Ruwan P.S. (2014-02-01). "Primary control level of parallel distributed energy resources converters in system of multiple interconnected autonomous microgrids within self-healing networks". IET Generation, Transmission & Distribution. 8 (2): 203–222. doi:10.1049/iet-gtd.2013.0126. ISSN 1751-8687. ^ a b c Ali Bidram; Ali Davoudi (2012). "Hierarchical Structure of Microgrids Control System". IEEE Transactions on Smart Grid. 3 (4): 1963–1976. doi:10.1109/TSG.2012.2197425. ^ Chandrasena, Ruwan P.S. ; Shahnia, Farhad; Ghosh, Arindam; Rajakaruna, Sumedha (September 2014). "Secondary control in microgrids for dynamic power sharing and voltage/frequency adjustment". 2014 Australasian Universities Power Engineering Conference (AUPEC): 1–8. doi:10.1109/aupec.2014.6966619. ISBN 9780646923758. ^ Fürst, Jonathan; Gawinowski, Nik; Buettrich, Sebastian; Bonnet, Philippe (2013-09-25). "COSMGrid: Configurable, off-the-shelf micro grid". Proceedings of the 3rd IEEE Global Humanitarian Technology Conference, GHTC 2013: 96–101. doi:10.1109/GHTC.2013.6713662. ISBN 978-1-4799-2402-8. ^ Buevich, M.; Schnitzer, D.; Escalada, T.; Jacquiau-Chamski, A.; Rowe, A. (2014-04-01). "Fine-grained remote monitoring, control and pre-paid electrical service in rural microgrids". IPSN-14 Proceedings of the 13th International Symposium on Information Processing in Sensor Networks: 1–11. doi:10.1109/IPSN.2014.6846736. ISBN 978-1-4799-3146-0. ^ Buevich, Maxim; Zhang, Xiao; Schnitzer, Dan; Escalada, Tristan; Jacquiau-Chamski, Arthur; Thacker, Jon; Rowe, Anthony (2015-01-01). "Short Paper: Microgrid Losses: When the Whole is Greater Than the Sum of Its Parts". Proceedings of the 2Nd ACM International Conference on Embedded Systems for Energy-Efficient Built Environments. BuildSys '15: 95–98. doi:10.1145/2821650.2821676. ISBN 9781450339810. ^ Kirubi, et al. “Community-Based Electric Micro-Grids Can Contribute to Rural Development: Evidence from Kenya.” World Development, vol. 37, no. 7, 2009, pp. 1208–1221. ^ "Microgrid at Stone Edge Farm Wins California Environmental Honor". Microgrid Knowledge. 2018-01-18. Retrieved 2018-06-28. ^ "Stone Edge Farm — A Sandbox For Microgrid Development | CleanTechnica". cleantechnica.com. Retrieved 2018-06-28.